Color: Multi-Color Horse motif with English hunter, hounds and hunting horn on beige background. We strive to provide superior service, but if we make an error, we'll make every effort to make it right. Condition: Fair, fading on the white collar and cuffs. Pointy collar. Center back under collar to hem: 28. Shirt tail hem. Fabric: 100% Cotton. Sleeves: 22. 1 drop pocket. Shoulder to shoulder: 14. ROCKABILLY STYLE! 2 HAND POCKETS! BUTTON FRONT! 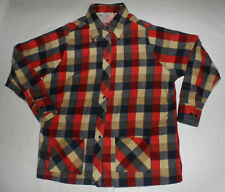 1960s SEARS PLAID COTTON SHIRT JACKET. PLAID PATTERN. TWO HAND POCKETS AT BOTTOM. ALL COTTON. BUTTON-UP FRONT. FEATURES JAMAICAN CHILDREN PICNICKING. 1960s COLORFUL HAWAIIAN STYLE SHIRT MADE IN JAMAICA! 'NATIONAL SPORT SHIRTS BY MANHATTAN'. A GREAT LOOKING SHIRT! ARMPIT TO ARMPIT 24". VERY COLORFUL. SINGLE CHEST POCKET. SHADOW PLAID! USA 14.5 32. 1960s 'H BAR C CALIFORNIA RANCHWEAR' WESTERN SHIRT! SHADOW PLAID. A GREAT LOOKING SHIRT! NO MATERIAL LABEL, I THINK IT IS A COTTON BLEND. TWO CHEST POCKETS. MADE IN USA. This shirt's labeled neck size is 20 and has never been worn. King Kole is known for their impeccable quality textiles and woven flannels and this shirt is no exception with great tartan plaid details and bright colors. Fabric :Shell : 100 % Flannel Cotton - Lining : 100% Nylon with Polyester Fiberfill. Color :Black - Red - Orange - White - Burgundy and Butterscotch. For Rodier, the first function of the mill was to act as a laboratory for the production of new yarns, new textures, and above all inventive designs reflecting the spirit of their age. Paul Rodier and his family were not only master weavers, but artists and editors. It features that classic disco collar and a left breast pocket. Great look and feel! Manufacturer: Spire California. Sleeve length from shoulder to opening: 11”. Materials: 100% Textured Polyester. Condition: Always wash before you wear! No stains, holes or issues, like new! No smoke household. EARLY 1960’S BUTTON DOWN COLLARED SHIRT MEN’S LARGE. SLEEVE CUFF SHOW LIGHT FREY WEAR, ALONG WITH 3 LIGHT PIN HEAD SIZED SPOTS ON THE RIGHT BACK OF THE SHIRT WHICH DOESN’T DISTRACT AT ALL. PLEASE SEE THE PHOTOS. WORE THIS SHIRT MOSTLY IN THE EARLY 1970’S IN THE SURF SEEN IN HUNTINGTON BEACH ON THOSE NICE SUMMER NIGHTS AT THE PIER. Zippers on the Pant cuffs. VTG Jantzen Sweater Men's Med, Ladies XL, Cabin Chic, happy hipster, fits large nicely! 1960'S Flower Power Hippie Shirt Men's Medium. Great graphics pictured. There are 3 pin holes I pictured with a pen. Please email me with any questions I can only ship on the weekend as I work Monday through Friday. Shipped with USPS Priority Mail. Zippers on the Pant cuffs. Pants & Jacket Size Small. Notched lapel. Center back bottom of collar to sleeve cuff = 33” (84 cm). Shoulder seam to sleeve cuff = 24” (61 cm). Cotton blend material, does not stretch. Available to let out Sleeve Cuff = 2” (5 cm). 1960’S MEN’S SPORT SHIRT (M) BULLOCK’S SANTA ANA CA. MADE OF COVENTRY COTTON , TAPERED DESIGN. ORIGINAL OWNER. IF YOU LOOK AT THE PHOTOS YOU WILL SEE A SMALL HOLE ON THE RIGHT REAR ARM SEAM, ALONG WITH 2 MINUTE SPOTS, ONE UNDER FRONT POCKET & TOP OF LEFT SHOULDER SLEEVE. NONE OF THESE ARE NOTICEABLE AND OR DISTRACT FROM THEIR VINTAGE LOOK. WORE THIS MOSTLY IN THE 1970’ IN COASTAL SO. CAL, THOSE WERE THE DAYS ! Size 11, no mfg. info that I can read. Obviously worn, but still have all stitching intact, heels and soles well-worn and cracked. Sorry, no original box. Really superior quality blazer. Shoulder to shoulder: 18. Sleeve length, from shoulder: 24. - three button front. Size: Unknown, likely 40. Waist: 19. Vtg 50's 60's Rever Rockabilly Ivy League V Neck Acrylic Fuzzy Sweater. Sleeve length 26".Pit to pit 22".Top to bottom 28". Pit to pit 22 ".Top to bottom 30 ". Colour :Cobalt Blue & Green Cobalt Blue and Golden Brown Burgundy & Black. Fabric :Polyamide Nylon : Stretch Fabric. Colour :Cobalt Blue & Green Chocolate Brown and Tan Burgundy & Black. Fabric :Polyamide Nylon : Stretch Fabric. Details :3 Different Designs - Reinforced Heels & Toes - Elasticized Fabric. Excellent condition vintage red plaid wool barn coat. Quilted lining No tears holes or fraying Solid button sewing See photos for measurements Size 40-42? (Not tagged) Need a measurement? Just ask. Thanks! !